When a parent of a grandchild abuses drugs or alcohol, grandparents are put in a terrible position. Of course, a grandparent's first instinct is to try to fix things, but substance abuse can be an intractable problem. Often, grandparents must settle for doing everything possible for their grandchildren, but even that course of action has risks. Does Drug Abuse Constitute Child Abuse? Grandparents who love their grandchildren think that they deserve non-addicted parents, and this is true. All children deserve parents who are fully there for them. Parents are not perfect, though, and can struggle with a variety of issues. Unless a child is being injured or neglected, a parent's drug or alcohol abuse is unlikely to qualify as child abuse. This is especially likely to be true when there is another parent in the family who ensures that children get appropriate care or when a parent's drug abuse does not occur when he or she is in charge of the children. Some steps that grandparents can take are obvious ones. They can make sure that the grandchildren know that they have people in their lives who love them and will see that they are taken care of. They can nurture their relationship with their grandchildren so that if they ever have to take over their care, the children won't feel that they are being turned over to strangers. They can create opportunities for the grandchildren to be with extended family, to get to know aunts, uncles, and cousins. Those family members also often step in during family crises. Pointing out a parent's faults is seldom productive. Even children who know that a parent has a substance abuse problem want to believe the best about their parent. Hearing a grandparent verbally attack a parent is likely to cause problems in the grandparent-grandchild relationship. In addition, parents can be quick to cut off grandparents who are perceived as working against them. The most essential thing that grandparents must do is to preserve contact with the grandchildren. Sometimes grandparents struggle with staying quiet, feeling that they must take a stand when parents engage in the unwise and destructive behavior. Doing otherwise feels inauthentic and wrong. Speaking up about someone's drug or alcohol habit seldom changes anything, however. If only it were that easy! And staying quiet does not constitute an endorsement of their behavior. If grandchildren bring up the topic, however, grandparents may take advantage of the opening to discuss the dangers of substance abuse in a way that is age-appropriate. It is still best, however, to refrain from placing blame. Parental substance abuse can have a wide-ranging impact on families. Often, there are economic consequences, as the addicted parent can have difficulty holding a job or may miss work. Sometimes children are given basic care but don't get help with homework, health routines, grooming, or other non-essential but important items. In the case of economic struggles, grandparents are put in a no-win situation. If they readily step in with economic aid, they may be enabling a parent's habit by making it possible for them to spend even more money on alcohol or drugs. The usual money mistakes that grandparents sometimes make with adult children can have a greater impact when substance abuse is in the picture. Generally speaking, it may be best if grandparents bail out the parents only when not doing so will have a direct and detrimental impact on the grandchildren. Even when parents struggle with abuse, they usually still see themselves as loving parents and want to fill the parental role. Thus, it is important for grandparents not to overstep boundaries. A grandparent who is afraid that there is no money for school clothes, for example, can offer to take the grandchildren shopping and can even include the parent in the excursion. This is a far better solution than just buying clothes for the children without asking the parents or allowing them to have input. Ambivalence: Children typically love their parents, even when they may dislike the way alcohol or drugs make them behave. Confusion: Children of substance abusers never know what to expect, because they never know when a parent is going to be under the influence. Lack of Trust: Because alcoholics and substance abusers often promise and fail to deliver, children sometimes grow up feeling that they can't trust anyone. Guilt: Substance abusers often blame their behavior on other family members. It's only natural for children to wonder if they are at fault, even when they are not named. Shame: Since it's natural to identify with family members, children may take the shame of addiction on themselves. Worry: Once children reach a certain age, they realize that substance abuse has consequences, including accidents and run-ins with the law. They may worry that their parent will be incarcerated or die. They may also know that abusers sometimes lose their parental rights, and they may worry about losing their family. Of course, statistics also show that children of substance abusers are more likely to have such problems themselves. Still, the majority of such children do not end up as substance abusers, and the presence of loving grandparents can be a positive force working against the repetition of the cycle. 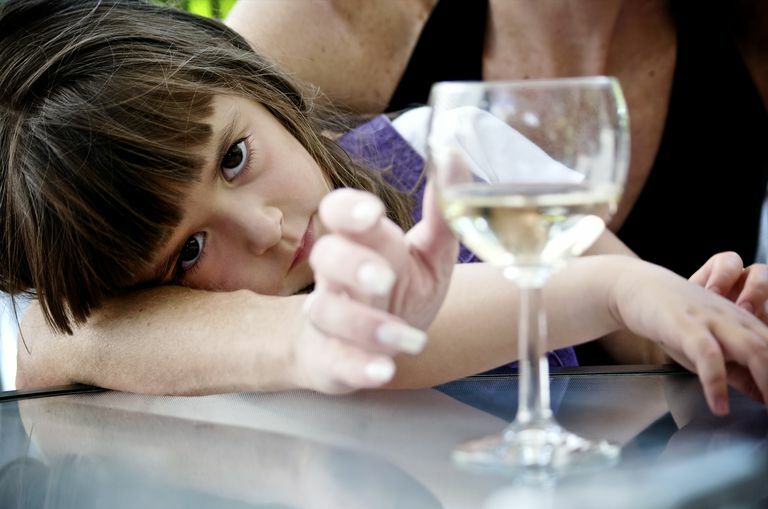 Substance abuse in a family also affects a child's psychological and social functioning. Children feel at fault or feel that they must try to fix things. When children react in this way, they often feel a lot of pressure. They may feel that they must be perfect in every way. Grandparents can help by taking any opportunity to point out that the situation is not their fault and that they do not have the power to fix it. They can encourage their grandchildren to do their best but let them know that it's also okay to mess up occasionally. At other times, children under-perform or act out. This is a more difficult syndrome for grandparents to handle. They can try to stave off academic difficulties. There are many ways that grandparents can support their grandchildren in school. A truly troubled child, however, will need counseling or therapy. Grandparents can sometimes get parents to agree to such measures if they refrain from tying the child's behavior to a parent's substance abuse. Children whose parents abuse alcohol or drugs are often reluctant to bring friends home. This reluctance can impact their social development. Grandparents can help by sometimes including their grandchildren's friends in outings and visits. This is a practice that needs to be developed early on, however. If grandparents don't include friends when their grandchildren are young, it's unlikely to work when they try to include the friends of tween or teen grandchildren. Yes, many grandparents would prefer to have their grandchildren all to themselves rather than sharing time with their friends. Still, what is best for the grandchildren should be the controlling factor. Although substance abuse on the part of a parent doesn't automatically qualify as child abuse, abuse can occur when a parent is under the influence. Children can also experience neglect, usually defined as a failure to provide food, clothing, shelter, or medical care. Neglect can also occur when parents fail to protect children from risk. Grandparents who know that grandchildren are being abused or neglected are legally and morally bound to report the situation, even if it is the grandparent's own child who is at fault. Sometimes, however, grandparents are unsure whether a situation really qualifies as abuse or neglect. Every state has an abuse hotline, and those who man the phone lines can often offer clarification. Sometimes reports can also be made online. Although reports can be made anonymously, it is best when callers provide their names and contact information so that they can be asked for further information or verification. One's identity can be kept confidential. In the case that children must be removed from the home, most grandparents will want to be contacted so that they can be involved in care decisions. In fact, a 2008 act ensures that grandparents have that right. Many grandparents in this situation end up raising grandchildren, either as official foster parents or in a more informal custodial placement. Of course, grandparents who report abuse run the risk of being cut off from grandchildren, especially if the agency decides that the children are not at risk. Even if a report is anonymous or confidential, parents may correctly deduce the identity of the reporter. Also, parents sometimes simply withdraw from contact with any outside parties. They may even move to avoid contact with protective services. Still, if grandchildren are truly at risk, grandparents have no choice. When grandchildren are in a bad situation, grandparents suffer, too. When grandchildren live with a drug abuser, grandparents may feel that it is their fault. If the abuser is their own child, they may feel responsible in some way. If the abuser is the spouse, they may feel that they should have opposed the relationship. The truth is that individuals are responsible for their own decisions. Second-guessing every decision that one made as a parent is unproductive and will only cause additional problems. One of the best strategies for grandparents dealing with an abuser in the family is to live the best life they can. By caring for themselves physically and emotionally, grandparents will offer their grandchildren positive role models. They will convey that life is full of possibilities. They will be physically and emotionally able to offer their grandchildren a safe place when it is sorely needed.